I was browsing through B & N the other day in the Christian fiction section and noticed many books by Ted Dekker that looked interesting. Instead of buying I went to our public library and picked up a couple of his books that were on the shelf. Immanuel’s Veins was the first one. 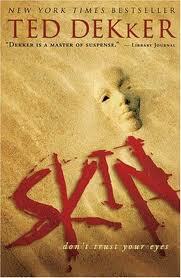 Skin reads like a thriller/horror. Starts off with a major storm moving through Arizona and the story of several people caught in this storm and the small town that it hits. At the same time as this storm hits a crazed killer begins knocking off residents and police in serial killer form. Normally I wouldn’t read this kind of a book but for two reasons I just kept going. First, because he’s supposedly a “Christian” author and I thought there would be some kind of moral lesson or spiritual warfare going on like with a Frank Peretti novel. Secondly, I simply couldn’t put it down. The story is gripping and keeps your attention and drives on through chapter after chapter. After just a few chapters I wondered how this book can keep this intensity for the rest of the book. It did just that and kept you guessing as to the solution to the problems it reveals until the very end. It was a fun read. That said, I wouldn’t characterize this as “Christian” by any means. There were some Christian principles but barely. The violence was horrible and nothing about the truth of the Gospel was ever approached. The only moral is this: man is ugly to the core. This is true but there was no “cure” which is what the Gospel reveals. That was disappointing.